Most people love babies and are attracted to them. The thought of a newborn baby lying in a manger, surrounded by gentle animals and a few adoring visitors is a delightful vision to us. We enjoy the nativity scene and we celebrate it. However, I have some disturbing news for you. 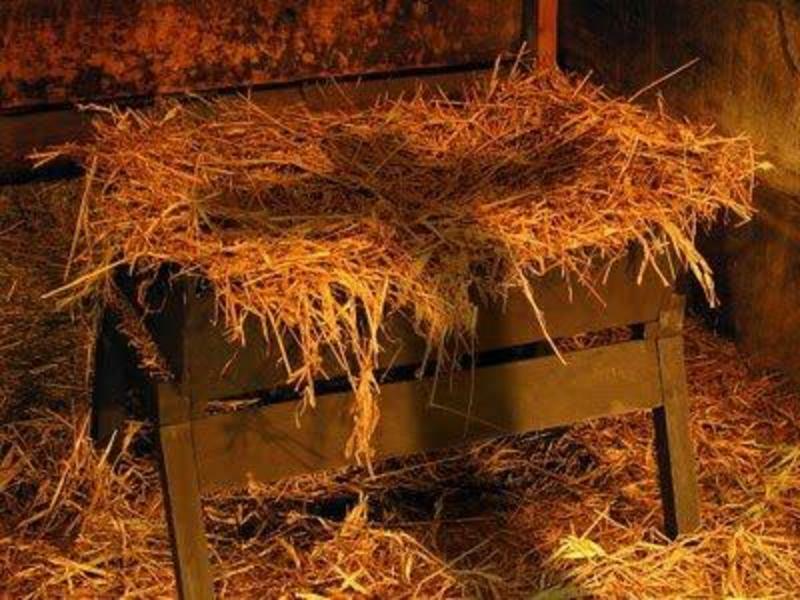 The manger is empty. On the other hand, I have some good news for you. The grave is empty, too. Today, Jesus Christ, who occupied both the manger and the grave, is alive and sits at the right hand of the Father, interceding for you and me. He did not abandon or leave us, for Emmanuel—God with us—is still here. He is the Holy Spirit. Furthermore, this same Jesus, whom we celebrate and worship, is preparing a place for us and is coming again to gather us unto Himself. We will meet Him in the same manner the disciples saw Jesus leave during His ascension into Heaven. Are you looking forward to that day? The return of Christ is going to be glorious, superior to His birth announcement! However, not everyone will be ready, because they are not expecting Him nor looking forward to Him coming. To most people, His appearance will be troubling. 2 Pet 3:3-13 First of all, you must understand that in the last days scoffers will come, scoffing and following their own evil desires. They will say, "Where is this 'coming' he promised? Ever since our fathers died, everything goes on as it has since the beginning of creation." But they deliberately forget that long ago by God's word the heavens existed and the earth was formed out of water and by water. By these waters also the world of that time was deluged and destroyed. By the same word the present heavens and earth are reserved for fire, being kept for the day of judgment and destruction of ungodly men. But do not forget this one thing, dear friends: With the Lord a day is like a thousand years, and a thousand years are like a day. The Lord is not slow in keeping his promise, as some understand slowness. He is patient with you, not wanting anyone to perish, but everyone to come to repentance. But the day of the Lord will come like a thief. The heavens will disappear with a roar; the elements will be destroyed by fire, and the earth and everything in it will be laid bare. Since everything will be destroyed in this way, what kind of people ought you to be? You ought to live holy and godly lives as you look forward to the day of God and speed its coming. That day will bring about the destruction of the heavens by fire, and the elements will melt in the heat. But in keeping with his promise we are looking forward to a new heaven and a new earth, the home of righteousness. I think it must have been a sad day when God flooded the earth. Noah had been warning people for years to no avail. Jesus said they were eating and drinking, marrying, and giving in marriage. In other words, they went on with life, doing as they pleased, as though there was no reason to be concerned. But when the flood came, they cried out to Noah to save them. However, it was too late. They’d been given a chance, and when God shut the door it was shut. There was nothing Noah could do to save them. This is why the return of Christ going to be troubling to most people. Because they, like the people in Noah’s day, have heard the Gospel message repeatedly but they have deliberately refused to believe it and accept the salvation and lordship of Jesus Christ. They want to live their life free of any constraints and consequences. Anyone who warns them about the Truth is ridiculed and persecuted. Nevertheless, the judgment of God is coming one day–and the only way to escape the coming judgment is to repent of our sins, our self rule, and unbelief, and put our faith in Jesus to save us. It’s going to be troubling when Jesus returns, because there’s not going to be another chance for people to be saved. “Today is the day of salvation!” At that time, there will be nothing we can do to save them. 2 Thes 1:6-10 God is just: He will pay back trouble to those who trouble you and give relief to you who are troubled, and to us as well. This will happen when the Lord Jesus is revealed from heaven in blazing fire with his powerful angels. He will punish those who do not know God and do not obey the gospel of our Lord Jesus. They will be punished with everlasting destruction and shut out from the presence of the Lord and from the majesty of his power on the day he comes to be glorified in his holy people and to be marveled at among all those who have believed. This includes you, because you believed our testimony to you. When the Lord returns, only one thing awaits those who have not obeyed the Gospel call, and that is the wrath of God. I know people have been preaching the return of Christ for 2,000 years. But don’t let that keep you from believing it to be true. Time means nothing to God. He promised in His Word that He’s coming back: personally, visibly, and suddenly. And when He returns, it’s going to be one of two things for each of us. It’s either going to be a glorious event or it’s going to be a troubling event, and it’s up to you to choose which one it will be for you. Yes, the adorable nativity scene is history. The manger is empty. It is part of the Gospel, but the next time Jesus comes, He will not appear as a baby. He is going to LOOK DIFFERENTLY. Rev 19:11-21 I saw heaven standing open and there before me was a white horse, whose rider is called Faithful and True. With justice he judges and makes war. His eyes are like blazing fire, and on his head are many crowns. He has a name written on him that no one knows but he himself. He is dressed in a robe dipped in blood, and his name is the Word of God. The armies of heaven were following him, riding on white horses and dressed in fine linen, white and clean. Out of his mouth comes a sharp sword with which to strike down the nations. "He will rule them with an iron scepter." He treads the winepress of the fury of the wrath of God Almighty. On his robe and on his thigh he has this name written: KING OF KINGS AND LORD OF LORDS. And I saw an angel standing in the sun, who cried in a loud voice to all the birds flying in midair, "Come, gather together for the great supper of God, so that you may eat the flesh of kings, generals, and mighty men, of horses and their riders, and the flesh of all people, free and slave, small and great." Then I saw the beast and the kings of the earth and their armies gathered together to make war against the rider on the horse and his army. But the beast was captured, and with him the false prophet who had performed the miraculous signs on his behalf. With these signs he had deluded those who had received the mark of the beast and worshiped his image. The two of them were thrown alive into the fiery lake of burning sulfur. The rest of them were killed with the sword that came out of the mouth of the rider on the horse, and all the birds gorged themselves on their flesh. The next time Jesus comes, there will be no doubt about who He is. It will be obvious. The first time He came as a baby and only a few knew who He was. The next time He comes, everyone will see Him in His grandeur and realize He is the Lord. The first time Jesus came in poverty, the son of a carpenter, wearing simple clothes. The next time He comes in glory, the Son of the Living God, dressed in a robe dipped in blood, signifying that He gained His position and authority by the shedding of His own life’s blood. The first time Jesus came as an ordinary person with eyes of compassion, who had no crown except a crown of thorns. When Jesus comes again, He will be wearing “many crowns" and His eyes will blaze with fire. He will look everything like a king and more! The first time Jesus came to Jerusalem riding a lowly donkey; the next time He will be riding a magnificent white horse. The second time Jesus comes, Rev 1:7-8 says it will be different. “Look, he is coming with the clouds, and every eye will see him, even those who pierced him; and all the peoples of the earth will mourn because of him. So shall it be! Amen. "I am the Alpha and the Omega," says the Lord God, "who is, and who was, and who is to come, the Almighty." There will be no doubt Who He is for He will display His title boldly, “King of Kings and Lord of Lords”. He will have the armies of Heaven with Him; whereas, the first time He was here with only 12 disciples and a few followers. The next time Jesus comes, He’ll be everything the Jews wanted him to be the first time He was here and more. However, if they haven’t made Him their Lord and Savior, they’ll wish they’d never seen Him. This manifestation, this revelation - is one that those in opposition to Him will look upon and tremble. The baby in the manger is coming back, and the next time He comes, He will not come as a baby, but as King of Kings and Lord of Lords. "Every eye will see him!" and they’ll all know in an instant, "He’s the Lord." The whole earth will tremble at the sight of Him. Jesus’ return is going to be awesome! Every knee will bow. We had better meet the compassionate Savior today because we do not want to meet the King with fire in His eyes! Confessing Him as Lord then will be too late to save your soul, because when Jesus comes again, He is also going to ACT DIFFERENTLY than He did the first time. The first time Jesus came in humility as a servant. The next time Jesus comes, He will come with power and authority as a general of a vast army. The first time Jesus came as a man of peace to lay down His life so we could be saved. The next time He comes, He will use His sword against all unbelievers, people deceived by the devil to follow the ways of the world and their own desires. The first time He came to give us all a second chance to be sons of God. The next time He comes, all our chances will be over. Those who have not received Him as Lord and Savior before He returns, will be considered enemies of God and receive His wrath. Some people have the false impression that God has changed His mind about sin. Others think God’s Word is outdated and should be ignored. Those people are in for a rude awakening when the King comes riding on his white horse at the end of the age. Like in the days of Noah, when they hear the Truth today, they persecute those who live by His Word and who preach It to lovingly warn others. Recently in this country, we have witnessed businesses boycotted, sued, and fined. People have been fired from their jobs and some have had their children taken away because they live by the Word of God and express their faith. Regardless of their reaction to the Truth, the love of Christ in our hearts should compel us to warn people and encourage them to be saved from God’s wrath through faith in Jesus Christ. 1 Cor 6:9-11 Do you not know that the wicked will not inherit the kingdom of God? Do not be deceived: Neither the sexually immoral nor idolaters nor adulterers nor male prostitutes nor homosexual offenders nor thieves nor the greedy nor drunkards nor slanderers nor swindlers will inherit the kingdom of God. And that is what some of you were. But you were washed, you were sanctified, you were justified in the name of the Lord Jesus Christ and by the Spirit of our God. There will be no more second chances when Jesus returns. From the cross, the Son of God cried, "Father forgive them, for they know not what they do." But when He comes next time, the time for forgiveness will be over, because today we know what we are doing, for we have His Word. Many have rejected It, even in the Church. Judgment will be waiting for all who reject His Word and Jesus as Lord and Savior. Furthermore, the next time Jesus comes, He will have a DIFFERENT MISSION. The first time Jesus came, He continually frustrated those who knew Him best because they knew He had all this power, but He didn’t use it the way they felt He ought. They wanted Him to overthrow the dictatorial Roman government, set up a throne, and establish a kingdom that would never end. They did not understand His first mission. They wanted Him to do what He is going to do the next time He comes. The first time Jesus came, His mission was to redeem mankind by dying on a Cross, and rise again in three days to defeat death. Rev 1:18 I am the Living One; I was dead, and behold I am alive for ever and ever! And I hold the keys of death and Hades. The next time Jesus comes, His mission will be to reign forever. Rev 11:15 The seventh angel sounded his trumpet, and there were loud voices in heaven, which said: "The kingdom of the world has become the kingdom of our Lord and of his Christ, and he will reign for ever and ever." The first time Jesus came, the disciples and those who were for Him walked with Him on land. The next time Jesus comes, his disciples (including us) will be riding in the sky with Him as a part of the army of heaven! There’s only one way to enlist in that army: by accepting Jesus as your Lord and Savior. You can’t participate in His second mission if you refuse to accept what He did on the Cross in His first mission. You can’t reign with Him then if you don’t repent of your sins now and die with Him in baptism. You won’t ride with Him in the future, if you haven’t been born again of His Spirit in the present. Therefore, what are you looking forward to this Christmas? Presents? 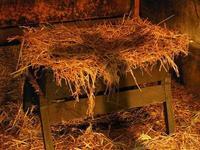 The manger is empty. So is the grave. You should be looking for Jesus to return. It could be today. If this were your last opportunity, would you be ready to meet the Lord? Rev 22:12-17 "Behold, I am coming soon! My reward is with me, and I will give to everyone according to what he has done. I am the Alpha and the Omega, the First and the Last, the Beginning and the End. "Blessed are those who wash their robes, that they may have the right to the tree of life and may go through the gates into the city. Outside are the dogs, those who practice magic arts, the sexually immoral, the murderers, the idolaters and everyone who loves and practices falsehood. "I, Jesus, have sent my angel to give you this testimony for the churches. I am the Root and the Offspring of David, and the bright Morning Star." The Spirit and the bride say, "Come!" And let him who hears say, "Come!" Whoever is thirsty, let him come; and whoever wishes, let him take the free gift of the water of life. Does your spirit cry out with the Holy Spirit to Jesus, “Come”? If you are not looking forward to His coming, we invite you to receive Jesus today. The greatest gift you could receive this Christmas is Jesus Christ, Who is the free gift of the water of life—eternal life. He invites you to “come”, repent of your sin, confess Him as the Son of God--your Savior and Lord, and die to your old life in baptism so you can be born again of His Holy Spirit. Then you will cry out with anticipation, “Come Lord Jesus, come quickly, for I love you and want to be with you.” This world, full of evil and doomed to destruction, will attract you no longer.